What is a North Carolina Promissory Note? North Carolina Promissory Note: What Is It? A North Carolina promissory note is a contract between a lender and a borrower for the repayment of a loan. In addition to the lender and borrower, there is often a co-signer. Promissory notes are secured or unsecured. A simple example of a secured promissory note is a car loan. If the borrower does not pay as promised or uphold the other terms within the contract, the lender will repossess the vehicle. An unsecured North Carolina promissory note is a promise to repay that is guaranteed by a signature instead of collateral. What Is the Maximum Interest Rate That Can Be Charged in North Carolina? If a North Carolina promissory note is in writing, the parties can contract a rate higher than 8%. Without a written agreement, the maximum interest rate is 8%. If the promissory note is for more than $25,000, consult the Commissioner of Banks, which is published on the 15th of each month, to determine the maximum allowable interest rate. Writing a North Carolina promissory note requires certain information and clauses. However, before that information is included, it is important to provide the proper title. If the promissory note is secured, it should be noted as such in the title. For example, North Carolina Secured Promissory Note. Without the word “secured,” a legal disagreement could result in the note being treated by the court as unsecured. After the title, basic information related to the parties and the loan is inserted to create the scope of the agreement. The date the promissory note was created. This date is placed directly below the title of the document. This date, along with the date of the signature, is important in determining the validity of the contract. Dates are also important in determining the statute of limitations for filing a lawsuit and for collections. Dates should be formatted as month, day, and year. Identify the parties and their roles within the contract. The parties are the lender and the borrower. If there is a co-signer, they should also be identified along with their role. Use the legal name of each party. For example, Donna Lenora Johnson, Co-Signer. List the mailing address for each party. The mailing address should include the city, state, and zip code for each party. If the North Carolina promissory note is secured, also list the physical address of the borrower and the co-signer if it is different from the mailing addresses. For lenders with a separate payment address, this section lists the main mailing address. The payment address should be included with the repayment information. The principal amount provided as a loan. This is the amount of money provided by the lender. It does not include the interest rate. Before the promissory note is signed and dated, this number should be checked for accuracy. The amount of interest charged yearly for the loan. If no interest amount is listed, the state maximum that may be collected is 8%. The parties may agree to a higher interest rate. The amount charged is generally expressed as yearly interest, per annum, or annual percentage rate (APR). Repayment information. This section explains how the borrower will repay the loan they received. It lists the number of payments that must be made, the amount of each payment, and the due date for each payment. The lender’s payment address should be listed here. If there will be a late fee, the amount and when it is assessed should be listed. For secured North Carolina promissory notes, it is important to document information about the collateral. This is necessary if there is a legal dispute. It can help ensure that the court treats the note as secured as opposed to unsecured. Interest Due in the Event of Default. This clause explains the interest rate that will be charged on the outstanding balance if the borrower does not comply with the terms of the agreement. It may be different than the initial interest rate charged. Payment Allocation. How the payments made by the borrower will be split between the principal balance and the accrued interest. Prepayment. This clause explains whether the borrower will be required to pay additional fees to pay the loan off early. Acceleration. 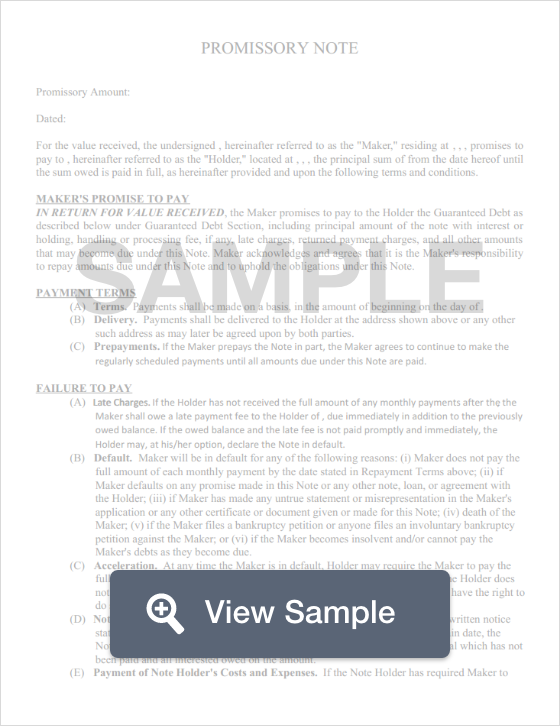 This is the lender’s right to immediately demand payment of the remaining balance when the borrower does not comply with the terms of the promissory note. Attorney Fees and Costs. The purpose of this clause is to explain how attorney fees and costs incurred because of a dispute over the promissory note will be handled. Waiver of Presentments. This clause states that the lender is not legally required to be physically present when payments are made on the loan. Severability. This clause essentially protects the rest of the promissory note and keeps it valid if one part of the note is found to be unenforceable. Conflicting Terms. This clause explains how any conflicting terms will be cleared up. Notice. A notice clause states whether the borrower will be notified if the lender plans to sue them for default. Governing Law. The purpose of this clause is to list the state whose laws will be used to govern the promissory note and any related dispute. Most North Carolina promissory notes have no legal requirement of notarization. The document should be signed and dated by the borrower. If there is a co-signer, this person should also sign and date the note.